"Love is the wonderful symphony of every beating heart. 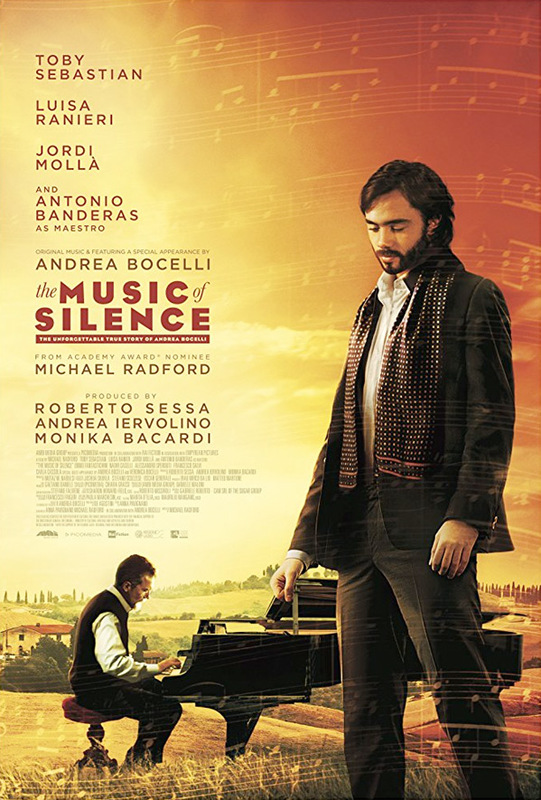 It is the divine music that whispers to us…" Ambi Distribution has released a new official US trailer for an Italian biopic film titled The Music of Silence, from filmmaker Michael Radford. The film tells the story of an Italian musician named Andrea Bocelli, who went blind when he was a child. Years later he became one of the most famous musicians, but not without trials and tribulations, of course. Toby Sebastian plays Bocelli, and the cast includes Antonio Banderas, Jordi Mollà, Alessandro Sperduti, Luisa Ranieri, and Antonella Attili; with a special appearance by the real Andrea Bocelli. This looks like a very Italian film, with lots of opera singing and beautiful scenes in the countryside. The cinematography here is particularly impressive, I just hope the rest of it is that good. Born with a serious eye condition that eventually leads to his blindness, Bocelli nevertheless rises above the challenges, driven by great ambitions towards his passion. The silent pursuit of his daily mission continues. Based on the extraordinary true story of Andrea Bocelli, who against all odds becomes one of the most world renowned opera singers. To date, he has sold over 80 million records. The Music of Silence is directed by veteran filmmaker Michael Radford, of the films Nineteen Eighty-Four, White Mischief, Il Postino, Dancing at the Blue Iguana, The Merchant of Venice, Flawless, La Mula, and Elsa & Fred. The screenplay is written by Anna Pavignano and Michael Radford. This first premiered at the Deauville Film Festival last year. Ambi will open The Music of Silence in select theaters starting February 2nd. Anyone?